Looking for something unusual to do in Brighton then look no further than a tour of the Old Police Cell Museum Of Brighton. 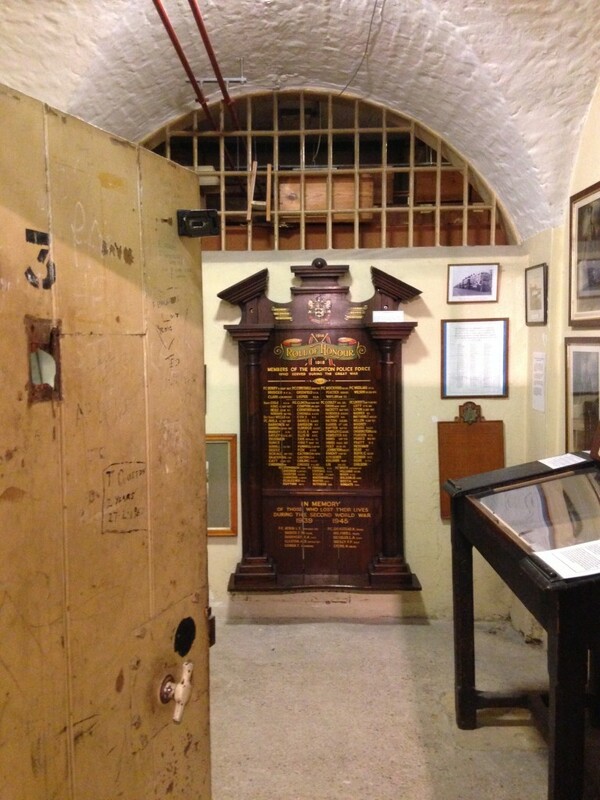 Hidden in the bowels of the Old Brighton Town Hall are the police cells that were operational until 1967. Thanks to the energy and resourcefulness of volunteers you can visit the old police cells and hear the sometimes dark and macabre history of the prisoners kept there. There also is a surprise on the tour with one of the oldest features of Brighton shown at the end. The museum is open for the summer season at the beginning of April from Tuesday through to Saturday until November 1st. During winter the museum is open on the first and third Saturday of each month or by pre-arranged party bookings. In order to visit you need to pre-book a guided tour which begin at 10.30 am and last around one and a half hours. To book your place, please telephone, in advance, Brighton Town Hall Reception on 01273 291052. Follow the link for directions on how to get there. The Old Town Hall is an impressive building located in the centre of Brighton. The building was constructed between 1830-1832 replacing the previous town hall. It was built due to the increase popularity of Brighton as a destination thanks to George IV building the Royal Pavilion and often visiting the town. Prior to the town hall there was a Priory which was burnt down 500 years ago during a French Raid in 1514. All the monks were killed and rumour has it there ghosts still roam the corridors of the Old Town Hall. The police and station were part of the town hall which resulted in some amusing stories of the accused being dragged through council proceedings until a separate entrance was built. After entering the Old Town Hall you are met by your guide who gives you a background information on the history of the Old Police Cells. The Old Town hall is still used as a registry and weddings are also held there. There is a lovely mosaic floor in the reception area with the original Brighton’s coat of arms In Deo Fidemus or In God we Trust. Our guide was the lovely Ken who had an impressive knowledge of the history and the murderers kept in the cells. I will not spoil your visit by letting the cat out of the bag and rather when you visit hear firsthand some of the tales of prisoners kept in the cells. Lets just say the police were kept busy and one of their own was the victim of what became a notorious murder in its day. After a few tales of past murderers and criminals, the tour guide takes you downstairs to show you first the washroom and toilet which as you can imagine are quite basic, the women prisoner cells and then the men prisoner cells. The cells have memorabilia from a marvelous collection of police batons to a photo of naked children being chased by a female police constable. We heard about the infamous battle of 1964 between the mods and the rockers as well as stories of past guests in the cells. Towards the end of the tour we were shown the oldest known well in Brighton and probably built prior to the Battle of Hastings in 1066. The tour is by donation only or free and is a great way to see some of Brighton’s more morbid history. Have you ever visited an old police gaol?